​Gardening is one hobby that a lot of people enjoy. However, it does come with its own challenges. One major challenge many people experience is dealing with thorny plants like roses. Without proper protection, you'll end up with cuts, scrapes, and scratches which you have to tend to. Fortunately, there are some excellent gloves out there. Those which you can use to protect yourself from thorns. Before you make a choice though, consider some important features of the gloves. As we've said, there are many different products out there. Choosing just one can be quite overwhelming. To help you out, we've searched for the best products available now. We've also reviewed them for you to make your choice easier. Among all the gloves we've seen, we believe that the Exemplary Gardens Rose Pruning Gloves for Men and Women are the best. Men and women can use these gloves for gardening without worrying about thorns. They're made of high-quality goatskin leather and cowhide suede. The gloves are also flexible so you can move your hands freely while wearing them. If you're looking for gloves with reinforcement and padding, then you can go with the Magid Glove & Safety Professional Rose Pruning Thornproof Gardening Gloves. These professional-grade gloves are durable, comfortable, and strong too. The best women's gloves with top-grade construction are the Bionic Women's Rose Gloves. These will cover your arms and your hands from the injuries you might get from pruning thorny plants. It's made of a Tough-Ex material to protect your skin. If you're looking for super-tough gloves which are also versatile, then The Protector Rose Gauntlet Gloves are your best bet. You can use these gloves for different tasks aside from gardening. They even have Velcro snaps to prevent any debris from getting in while you work. The ​gardening gloves should be tough enough to protect your hands from thorns. But they should also have enough flexibility. This will allow you to perform your gardening tasks freely. There are varying products available out there. All you need to do is choose one which will fit you comfortably. There are different types of gloves available too, and they vary in the materials they're made of. Some are sturdier than others while some are only meant for certain tasks. When making a choice, you should already have a good idea of what features to look for. This will make the selection process a lot easier. Also, when you consider all the important factors, you're sure to pick a superior product. Keep in mind that no two pairs of gloves are equal so doing your research is key. You don't want to spend your hard-earned money on an inferior product. One which won't provide you with the protection you need. These puncture-resistant gloves are of synthetic leather. They have reinforced fingertips and padded palms. The Magid Glove & Safety Professional Rose Pruning Thornproof Gardening Gloves are ideal for those who frequently work with plants that have thorns. The professional-grade gloves will provide you with comfort, durability, and strength too.The gauntlet cuff extends up to the elbows. This will provide protection to the forearms from scratches and cuts. The knuckle guard also protects from the thorniest of plants. The back of the gloves is of spandex that's form-fitting for the ultimate comfort. These gloves will let you prune your plants without having to worry about thorns. The gloves cover your hands as well as your arms with the thumb cover and the extra-long gauntlet. These are of Tough-Ex material which won't allow thorns to penetrate and pierce your skin. Even with constant use, these gloves will remain efficient. This is because of the construction. The Bionic Women's Rose Gloves also have relief pads which will naturally promote a secure and lighter grip. Finally, the Coolmax inserts provide extra ventilation. This is important so that your hands can release heat and breathe. With these gloves, you'll realize that gardening with thorny plants can be fun. The gloves will provide you with enough protection from cuts and scratches. Those which you may get while pruning roses and similar plants. The gloves are of high-quality goatskin leather. On the other hand, the gauntlet is of cowhide suede. These Exemplary Gardens Rose Pruning Gloves for Men and Women will definitely keep your arms and hands safe. They're flexible and pliable. So, you can maintain your dexterity for tasks which require fine motor skills. They also have lanolin which will moisturize your skin. The leather material is fairly thin. Just by the name, you'll know that these ​garden gauntlet will keep you protected. The USA-made gloves are of durable but soft goatskin. This material is long-lasting and puncture-resistant too. The gauntlet is of split cowhide, and the length will protect your entire forearm. The material will stay in place while still allowing you to move your arm freely.The Protector Rose Gauntlet Gloves have Velcro snaps which will help prevent debris from getting in. These versatile gloves are suitable for different tasks aside from pruning thorny plants. It's challenging to put them on. Just because these gloves are last on the list, that doesn't mean they're not up to par. 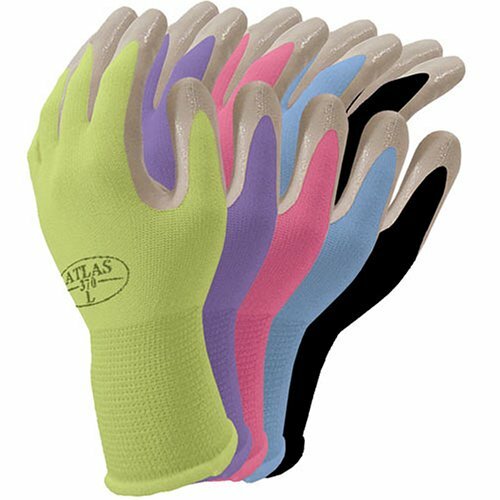 The Atlas Nitrile Gardening and Work Gloves are suitable for gardening and for working too. These are breathable, seamless gloves which outperform leather sans the bulk. They're machine-washable gloves. They have a sturdy nitrile coating over an ergonomically-shaped and seamless knit. This will provide you with durability, comfort, and dexterity too. The gloves come in different colors and different sizes too. So you can choose the one which appeals to you and fits your hands comfortably. They don't provide protection from moisture. Gloves for Gardening are very important. They can keep your hands and arms protected from thorns and other gardening hazards. A good pair of gloves can help you be more productive while working in your garden. If you've ever tried pruning thorny plants, you'll know that it's quite dangerous. This is especially true if you don't have the right tools and gear to protect yourself. This is where gardening gloves can shine. Before you choose a glove combo, it's a good idea to consider some important factors. Knowing these factors will help you make a better choice. From the size of the gloves to the types, there's much to know about gardening gloves. If you want to be able to use the gloves effectively, they must fit you snugly. It doesn't matter what type of gloves you have. If they don't fit, you won't be able to work well. Also, gloves which don't fit you well won't really protect your hands and arms. In fact, if the gloves are too small, you might develop blisters which are also painful. So before you make a choice, you need to know what size to get. Gloves meant for men and women have different sizes. They also have different shapes depending on the style of gloves and the brand you choose. If you buy gloves from a store, you should fit them first and move your hands to see how well they fit.If you're buying the gloves online, make sure to check the sizing chart of the manufacturer. Do this so you can choose the best size for your own hands. Usually, gloves run from S to XXXL. It's also helpful to read through customer comments to find out if the gloves run big or small. Aside from the size, you should also look for some practical features. For one, check if the gloves are of materials which are water-resistant. This will be very useful as you'll do your gardening outdoors. Also, waterproof gloves will reduce the risk of blisters and make your work easier. Try looking for a ​glove combo that will extend past your wrists. This feature will help prevent dirt and debris from entering your gloves. When this happens, you won't really get the protection you need. The grip is also an important feature to look out for. Check if the gloves you want have skid pads or other such features. Finally, consider the care you need to put into the gloves. It's best to go for durable gloves which don't require much maintenance. The more modern glove designs are of thinner materials and are even machine-washable. If the gloves you get aren't comfortable, you might not want to use them each time you work in the garden. So choose a pair which will permit you to do your gardening for a long period of time. Despite the longer gardening period, they should still be comfortable. Of course, don't overlook the durability of the product either. It doesn't matter if the gloves are comfortable when you only get to use them once. Then they fall apart, and you need to search for a new gloves. Find the right balance between these two factors to make sure you get a great product. These are the cheapest and most common types of gloves. They are machine-washable and usually made from cotton or knit jersey. You would use these gloves to maintain the cleanliness of your hands. They're cool and breathable, but they won't give you enough protection. 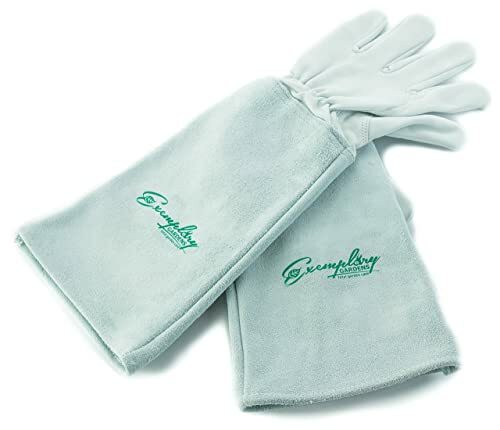 There are heavy and sturdy cotton gloves available which you can use for general tasks in the garden. These are snug, lightweight, and easy to maintain. However, even these heavier versions of cloth gloves won't protect you from thorns. Fortunately, manufacturers have made some innovations with cloth gloves. Now, they also have other materials incorporated into them. You may consider these types of gloves if you really want to go for a pair made from cloth. Leather gloves are generally more expensive, but they do provide better protection. With such gloves, you won't have to worry about cuts and scrapes from thorny plants. These gloves are usually waterproof too, which is a big advantage. These gloves are durable, strong, and comfortable too. They're perfect for gardening jobs as well as heavier tasks. Although they will protect you, leather gloves won't keep the moisture at bay. Because of this, some leather gloves have synthetic materials incorporated into them. These serve as a moisture repellent for the gloves. These gloves offer the best protection when you're working with chemicals. These include pesticides, fungicides, and herbicides. Since they're more durable, then you can also use them when you're pruning plants with thorns. However, your hands can get quite hot and sweaty in rubber-coated gloves. Also, you can't use this type of gloves if you suffer from a latex allergy. These gloves seal out moisture well. Also, the outdoor rubber-coated gloves are more durable. Nitrile or neoprene gloves are of a synthetic rubber material. They can protect your hands from cuts, scrapes, and chemicals too. These gloves are also flexible and breathable. However, thorns may still be able to puncture them. Gloves for thorns may seem simple, but as you can see, there's a lot to learn about them. If you really want to choose the best pair of gloves for your gardening needs, then you consider a lot of things. Fortunately, there are some superb products out there for you to choose from. No matter which one you choose, you're sure to end up with an excellent product. You can use the Magid Glove & Safety Professional Rose Pruning Thornproof Garden Gloves which are puncture-resistant. These gloves are strong, durable, and comfortable too. The professional-grade gloves will protect your hands and your arms as well. There are also the Bionic Women's Rose Gloves for your gardening needs. With these gloves, you don't have to worry about cuts and scrapes from the thorns on your plants. These will cover your hands and your arms with the gauntlet that's extra-long. Since the gloves are of Tough-Ex material, the thorns won't be able to pierce your skin. The best gloves for thorns in our list are the Exemplary Gardens Rose Pruning Gloves for Men and Women. You'll realize how fun and relaxing gardening can be when you use these gloves. They will protect your arms and hands from thorns. You can use them while you're pruning your roses or your other plants. They're of high-quality goatskin leather as well as cowhide suede. The best part is, they're ideal for men and women. The Protector Rose Gauntlet Gloves are also great. These USA-made gloves will protect your hands and arms. This is because they're of soft but durable goatskin. The material of the gloves is puncture-resistant and long-lasting too. 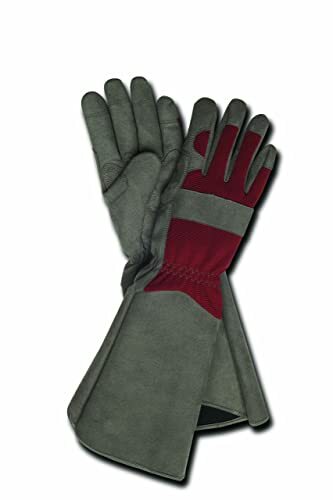 These are versatile gloves which you can use for gardening and for other tasks as well. Finally, we have the Atlas Nitrile Gardening and Work Gloves. These are also versatile as you can use them for other tasks aside from gardening. The seamless and breathable gloves come in different sizes and colors. So you can choose a pair with your favorite color and would fit you well too.